Relentless Bride® Weddings, Wedding Planning, Life & Marriage: Is this what you call nesting? Is this what you call nesting? So to start the new year, I had this incredible urge to clean our condo. It's not a big space, and what we'd like to call "small space living" or city living. We have a 1 bedroom condo in a great building, but we are expecting a child. That means - no nursery and shared space for our family including our little pup Kota. That being said, and because I'm a bit of a pack rat, we get clutter - VERY EASILY. I was moved with an urge to declutter this past weekend. I forced the Husband to go to Ikea friday last minute to get some book shelves and we came home. He put together the bigger one and I began to go through all our baby shower gifts, clothes, books, toys and items we had for the baby. The next morning we had an appointment to have our car detailed. Husband has a nice sturdy Jeep Cherokee, but he's had it for a while... with a Husky (about 10 years). And anybody with a snow dog knows, the amount of hair that can accumulate. So the car being detailed was his Christmas gift from his parents (thank GOD for my in-laws!). While the car was getting detailed, I convinced my Husband it was a great idea for me to put together the smaller book shelf while he was at work (po' guy had to work on NYE)... and I did. Here is the final result of our bedroom... a little space carved out for the FryBean. As you can see, there is a needlepoint that Husband's mom made for us that we have hanging over the changing area - which really is just the top of our dresser. 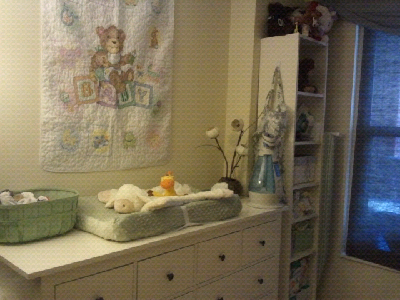 The new shelf has all the babies receiving blankets, toys, books, diapers and my nursing cover hanging on the side. A small space of heaven for the baby that is somewhat baby like. Not quite a nursery but it'll have to do. And thirty minutes later... (ok maybe longer than 30 minutes, these little contraptions are confusing!!!) TA DA!!! 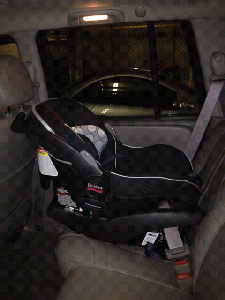 a nicely installed, secured infant car seat - ready to go should the baby arrive any day now ! You did do some nesting! Love the changing table space! I love your changing area, it's so cute. 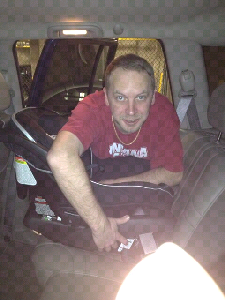 Installing those carseats really is a pain, took us a good 30 minutes to get it just right. Sounds like you are definitely in nesting mode! Happy New Year! I love the space you set up for the baby. So cute! Your changing space looks really cute. I bet changing your baby's cloth nappies will be less stressful with all that cute stuff hanging around.